Ross has unveiled improvements to the dual-post hydraulic lift and seal design of its 1500-gal Model PVM-1500 multi-shaft mixer. The new lifting design is a double-acting, fully hydraulic cylinder operating at a higher pressure, allowing for a smaller cylinder and significantly less oil for operation. 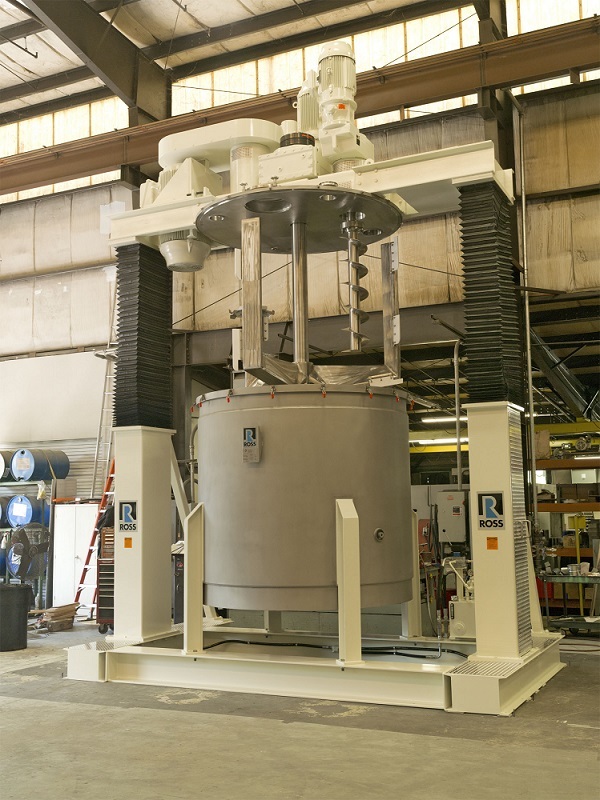 “The net result is a lifting system that operates at lower cost, requires less maintenance for the end user, and provides faster lifting speed when raising and lowering the agitators,” states David Hathaway, vice president, Ross Engineering. In addition, the new seal arrangement allows seal replacement without removing agitator shafts. Unlike the historical design, seal replacement no longer requires removal of the mixer from the tank nor tank entry to access the seal. The pictured PVM-1500 features three independently driven agitators: a screw auger, a high-speed disperser, and a three-wing anchor agitator. The sides and bottom of the changeable mixing vessel are insulated and jacketed for up to 50 psig. This vacuum-rated machine is designed to run 24/7, supplied with rugged touchscreen controls showing digital readouts for speed, cycle time, vacuum level, and batch temperature.